Women in India bear an unequal burden of diseases. Coupled with high maternal deaths, and higher deaths than men due to HIV/AIDS and TB is the recent upsurge in female deaths due to non-communicable diseases (NCDs). In 2015, NCDs accounted for 2.7 million women’s deaths in India, of which 1.1 million were due to cardiovascular diseases (CVDs). Gender specific data for all cardiovascular conditions and their risk factors are not routinely collected. With only 38% of the share of medically certified deaths collected by the Office of Registrar General in India, the exact burden of disease in women remains far from clear. 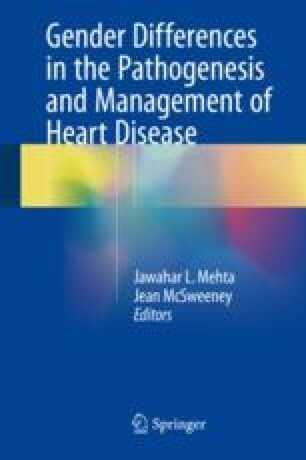 This review provides the unique aspects of cardiovascular health and disease in women. It presents gaps in the knowledge base regarding all aspects of CVDs in women and discusses issues surrounding women’s access to healthcare in India. A life course approach, originally advocated by Vedic culture, in shifting the trajectory from one of disease focus to healthy adults is advocated. We believe that targeting women’s cardiovascular health in India is essential to halt the CVD epidemic as it may not only improve their health but also of their families given their prime role in provision of nutrients to their family and inculcating other healthy lifetime habits. Office of the Registrar General &Census Commissioner, India. http://www.censusindia.gov.in/Vital_Statistics/SRS_Life_Table/Srs_life_Table_2011–15.html. Accessed 30 Aug 2017. Health System in India: Bridging the Gap between Current Performance and Potential. NITI Aayog (National Institute for Transforming India) Health Division Working Paper Series 1 Paper No. 1/2015. https://www.mygov.in/sites/default/files/master_image/Health_System_in_India.pdf. Last accessed on 11th Jan 2018. National Family Health Survey 4. 2015–16. India Fact Sheet. http://rchiips.org/NFHS/pdf/NFHS4/India.pdf. Accessed 29 Aug 2017. Maternal and Child Mortality and Total Fertility Rates. Sample Registration System (SRS) July 2011. http://censusindia.gov.in/vital_statistics/SRS_Bulletins/MMR_release_070711.pdf. SRS bulletin. Sample registration system. Registrar General, India. 2016;50(2). ISSN 0971–3549. http://www.censusindia.gov.in/vital_statistics/SRS_Bulletin_2015.pdf. Institute of Health Metrics and Evaluation. GBD Compare 2015. http://vizhub.healthdata.org/gbd-compare/. Accessed 15 Aug 2017.
WHO. Burden of NCDs and their risk factors in India (Excerpted from Global Status Report on NCDs-2014). http://www.searo.who.int/india/topics/noncommunicable_diseases/ncd_situation_global_report_ncds_2014.pdf?ua=1. Accessed 13 Aug 2017. Report on Medical certification of Death 2015. Office of Registrar General of India. http://www.censusindia.gov.in/2011-Documents/mccd_Report1/MCCD_Report-2015.pdf. Accessed 28 Aug 2017. Cause of Death. 2004–06. http://www.censusindia.gov.in/vital_statistics/Report_2004-06_Presentation_final.pdf. Accessed 28 Aug 2017. Jai Vigyan Mission Mode Project. Community Control of Rheumatic Fever/Rheumatic Heart Disease in India. Comprehensive Project report 2000–2010. http://www.icmr.nic.in/final/Jai%20Vigyan%20Mission%20Mode%20Project%20on%20Rheumatic%20Fever%20and%20Rheumatic%20Heart%20Disease%20(1).pdf. Accessed 23 Aug 2017. SARRC Development Goals-India Country Report-2013. New Delhi, India:Central Statistics Office, Ministry of Statistics and Programme Implementation, Government of India. http://mospi.nic.in/mospi_new/upload/SAARC_Development_Goals_%20India_Country_Report_29aug13.pdf. Accessed 24 May 2017. Global Adult Tobacco Survey. India 2009–2010. http://mohfw.nic.in/WriteReadData/l892s/1455618937GATS%20India.pdf. Accessed 24 May 2017. India’s Reproductive, Maternal, Newborn, Child, and Adolescent Health (RMNCH+A) Strategy A Case of Extraordinary Government Leadership. July 2014. http://www.mchip.net/sites/default/files/RMNCH+A%20in%20India.pdf. Accessed 2 Aug 2017.
http://dghs.gov.in/content/1363_3_NationalProgrammePreventionControl.aspx. Accessed 2 Aug 2017. National Pharmaceutical Pricing Authority. http://www.nppaindia.nic.in/ceiling/press13Feb2017/so412e-13-02-17.pdf . Accessed 11 Aug 2017. Society for Biomedical technology. http://www.sbmtindia.org/activities/kalam_raju_coronary_stent/. Accessed 24 May 2017. Tewari R. Industry Academia R&D Ecosystem in India. An evidence based study. 2017. ISBN 81-85322-61-9. http://cpr.puchd.ac.in/wp-content/uploads/2017/05/Industry-Academia-RD-Ecosystem-in-India.pdf.